Hello Everyone ? I hope you all having a wonderful weekend ? 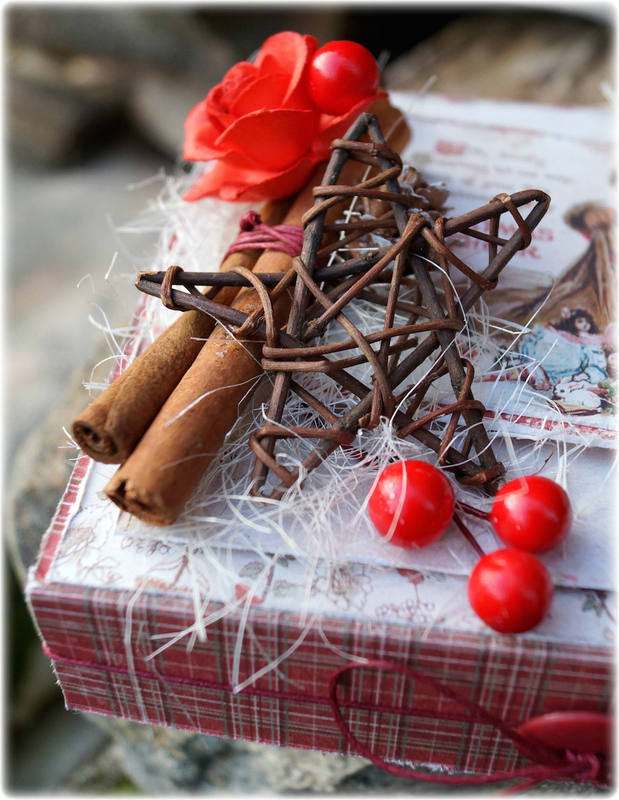 Today it is me, Silje Kristin that are reay with some Christmas inspiration, made with some lovely Maja Papers ? 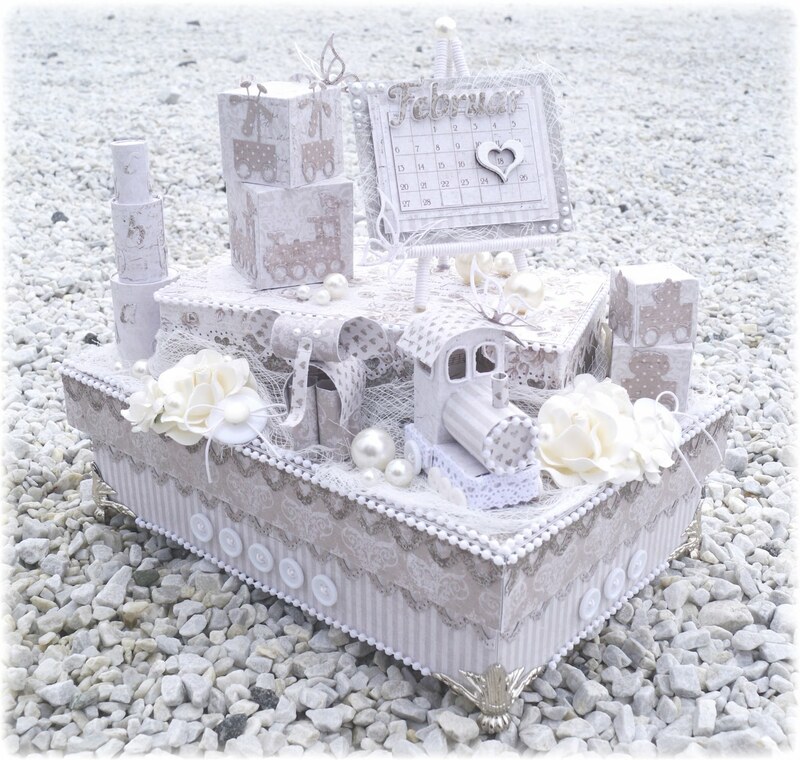 I like many others have is in love with the new collection to Maja Design – I Wish. I’ve spent more of the gorgeous sheets that can be found in the collection. The sheets I used on this project is: I Wish Christmas was Today, I Wish Santa will Remeber Me, I Wish we will deck the Halls and I Wish to play in the Snow. I’ve made a box where I can get the box with chocolate hearts inside. The box fits the dimensions of the box with the chocolate hearts. 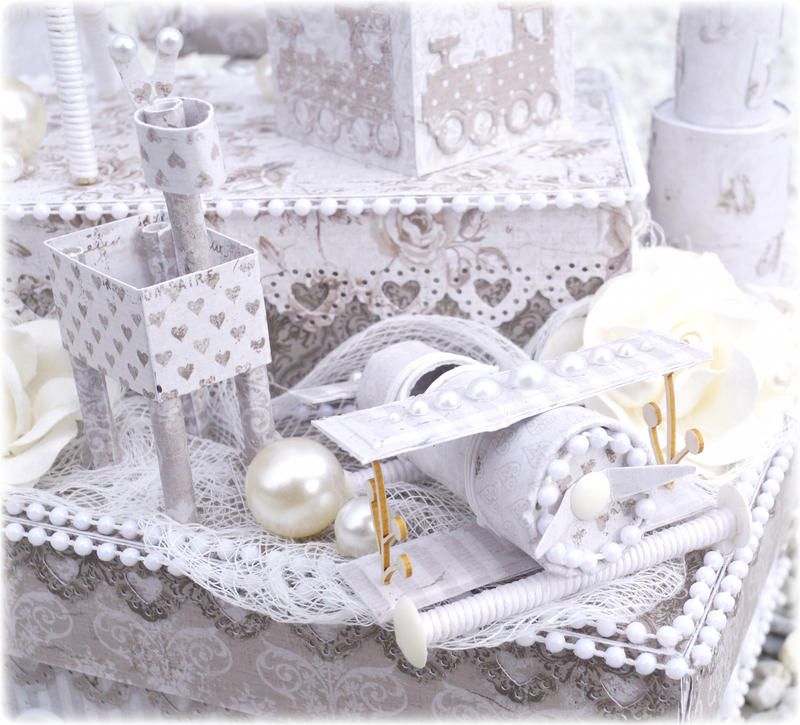 On the top of the box I’ve chosen to decorate with details that remind us of Christmas. 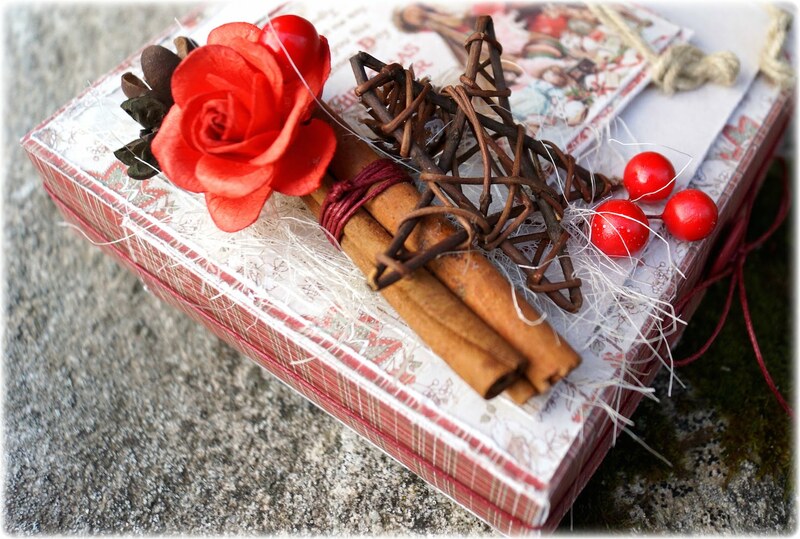 Cinnamon stick, red berries, stars of wood, pinecone, big red button with ribbon and a red flower. 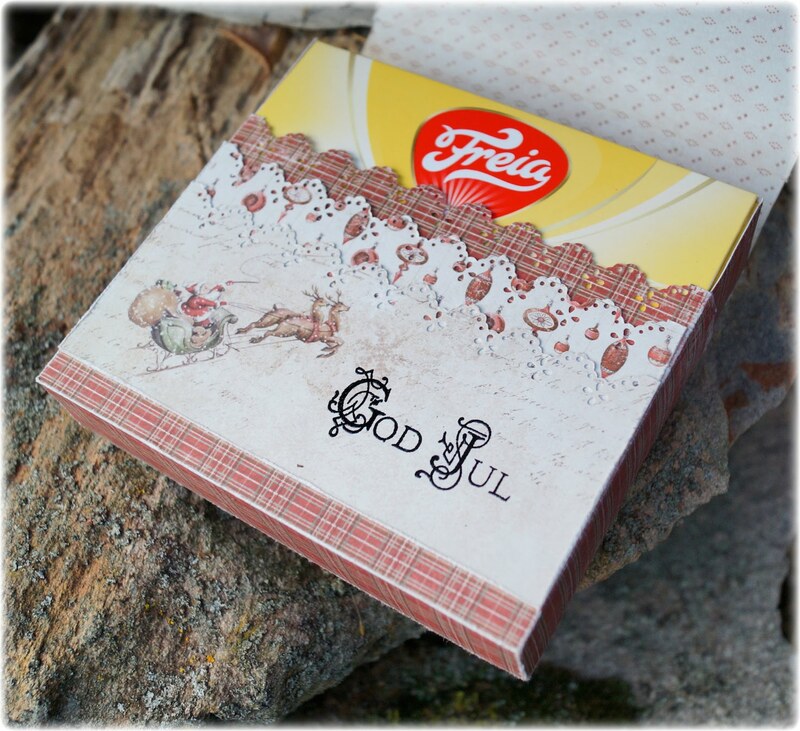 The image on the chocolate box is taken from the sheet called I Wish – ephemera. This is a sheet with some lovely Christmas designs. 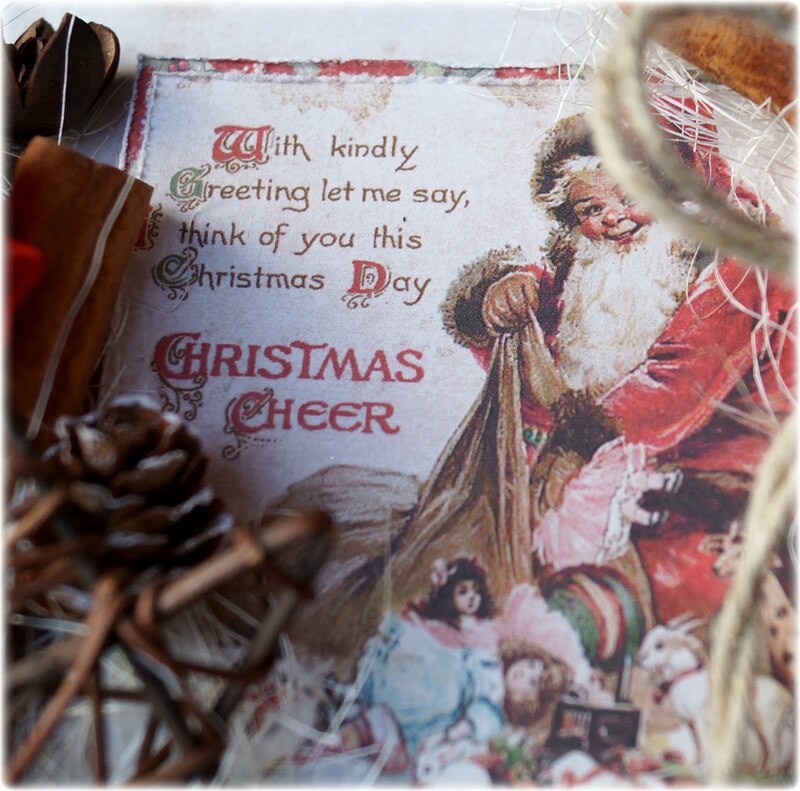 I have used the Santa Claus, with the text: With kindly Greeting let me say, I think of you this Christmas Day. Christmas Cheer. Seems this text fits perfectly to the lucky one that get this Christmas gift ? 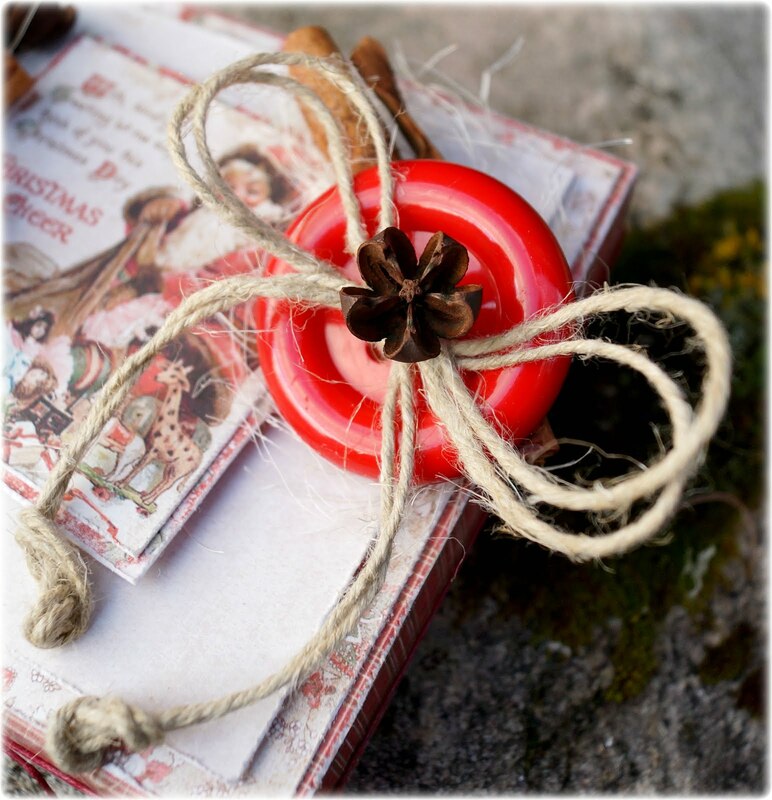 Around the box, I have red wax tread which is attached with a ribbon and button in the front. Taking this away, you can peek to see what’s inside ? The Stamp I have chosen to use seys Merry Christmas only on Norwegian, the stamp is from kaBoks. I’ve used black embossing powder from Ranger. A easy, but lovely Christmas gift from me today ? 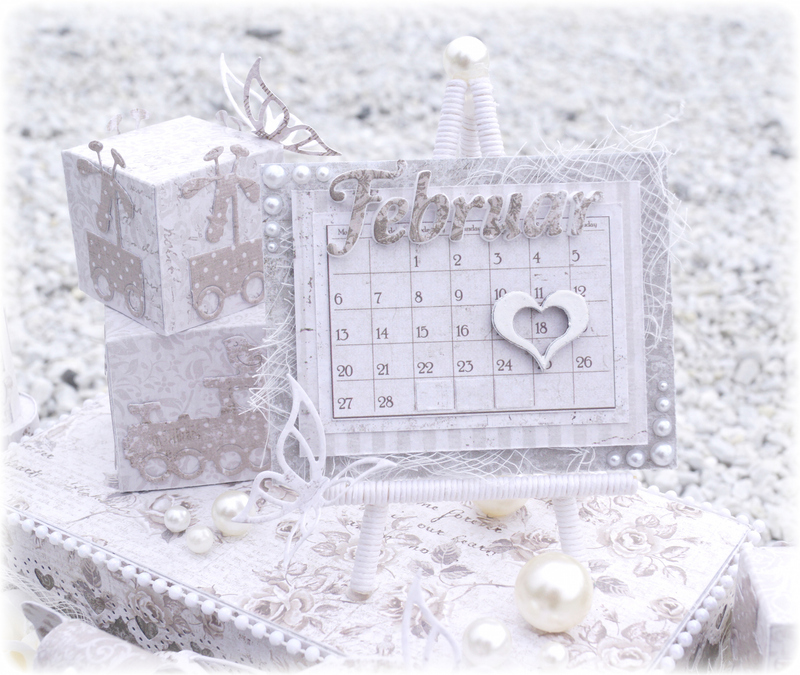 Today it is me, Silje Kristin, turn to inspire you with a project created with gorgeous paper from Maja Design. 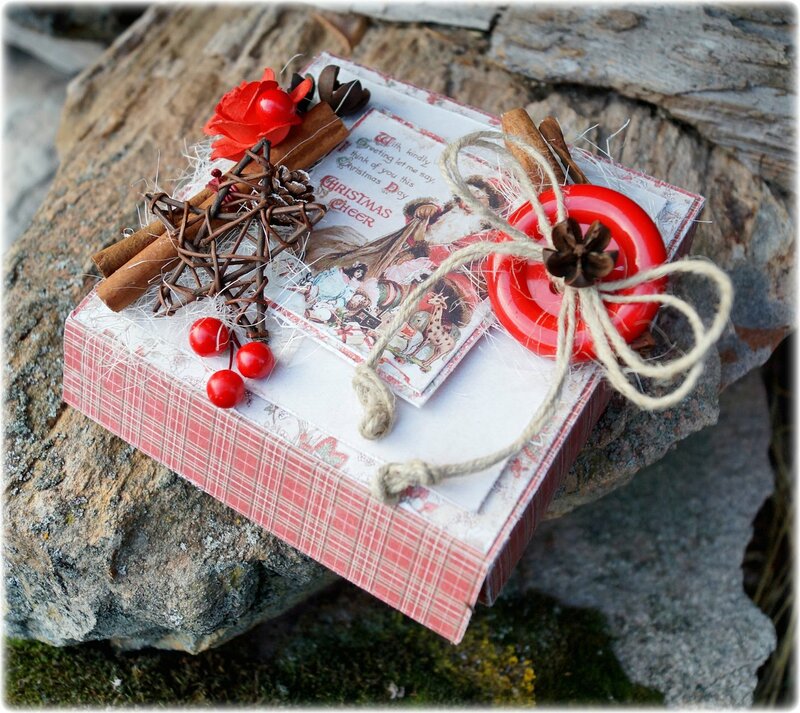 For this Christmas gift I have taken various paper from Maja Design collection Walking in the Forest. 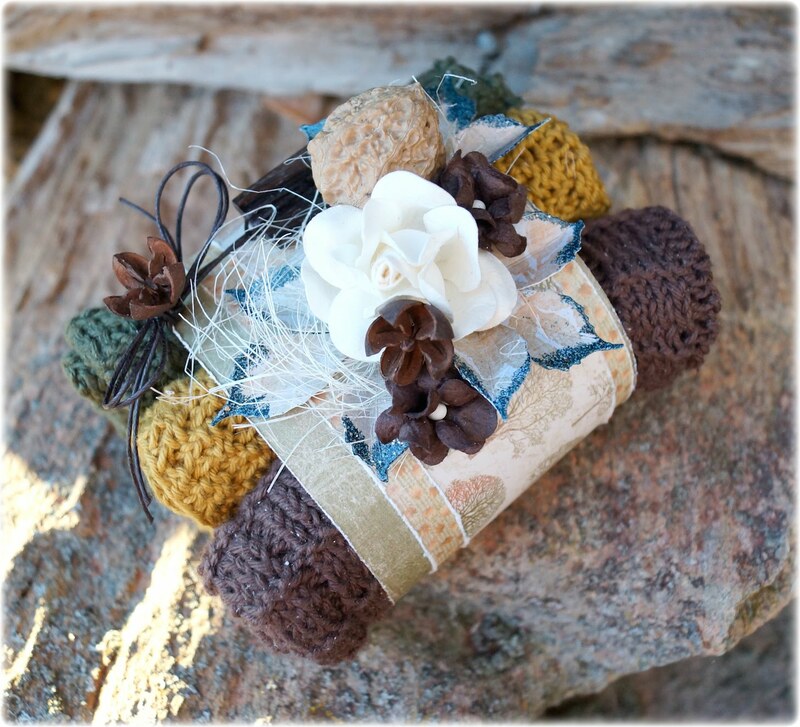 For me this was a natural choice, since the I knitted in autumn tones. I’ve used 3 different sheets: The Colours of Fall, Autumn in the Air and When Leaves are Falling. What I’ve done is I’ve folded the cloths in the same size, then I cut up strips in the current pattern sheets and put them together on the back with double sided tape. 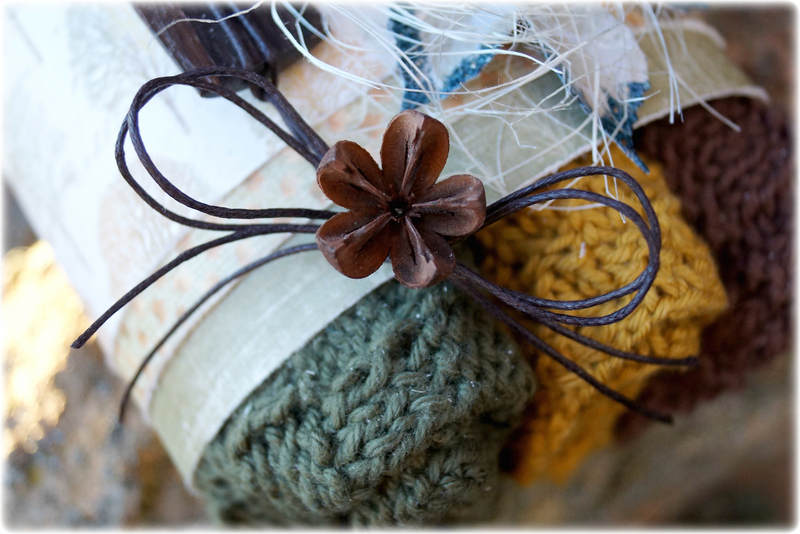 On the left side I have attached a brown button with wax thread, I have attached the thread with a bow. Atop of the bow I have attached something I do not quite know the name of. 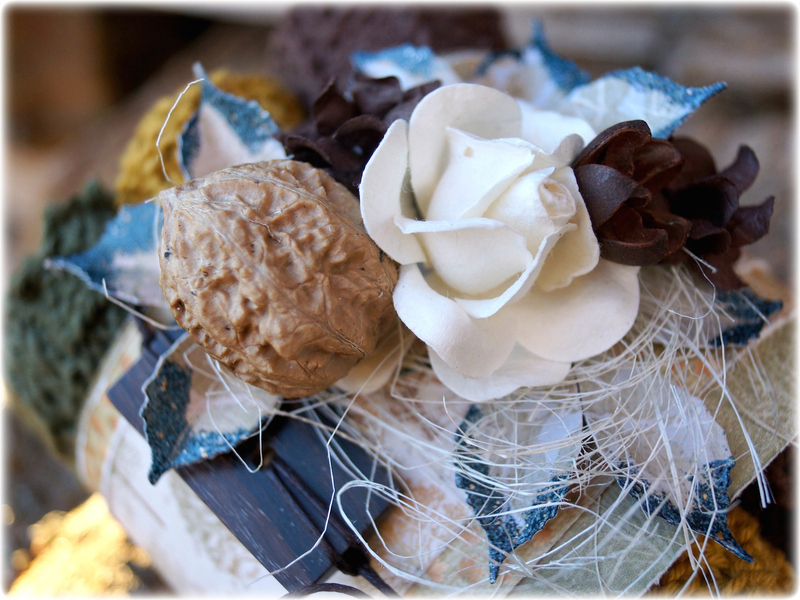 Other details I have used is walnut, straws and brown and white flowers. Under the flowers and the other details I have autumn leaves, which are punched out with a dies from one set of five autumn leaves. To break the traditional fall colors I have chosen to use one Embossing powders from Stampendous called Aged Marine. Should any of you wonder, my cloths are knitting with needles in sizes 4, between 55-60 stitches. 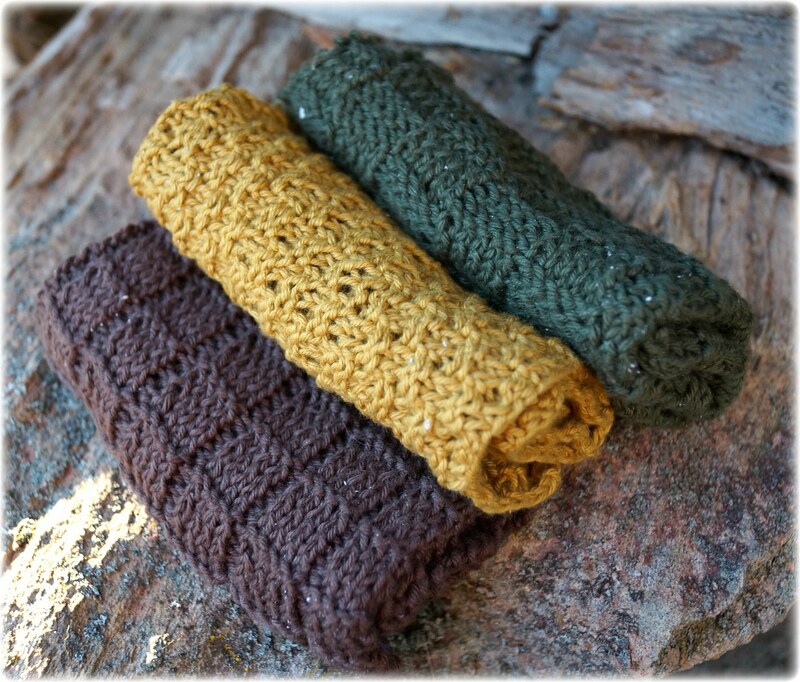 The cloths are knitted with cotton yarn, until they are one square. 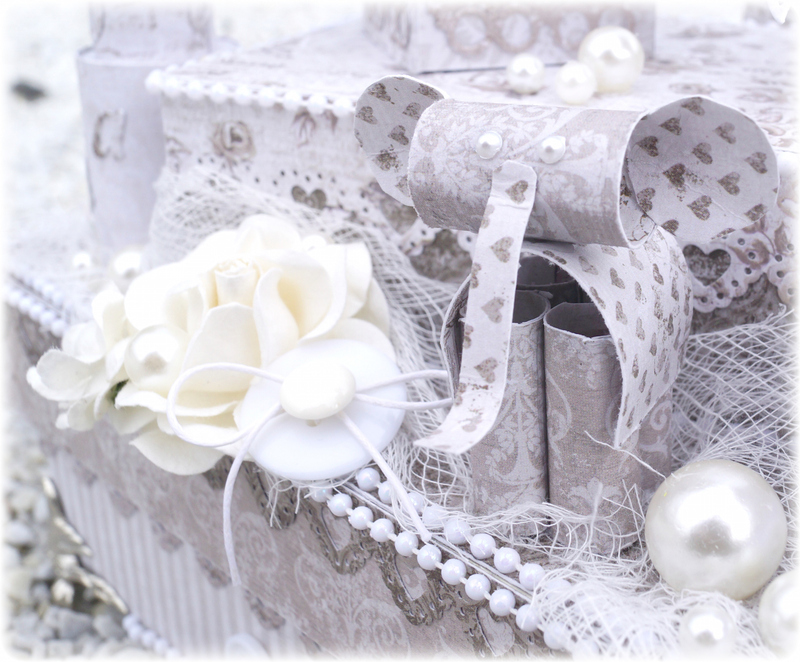 Today I am ready with a step by step made for Maja Design, I intend to show you how you can decorate various boxes in a easy way. 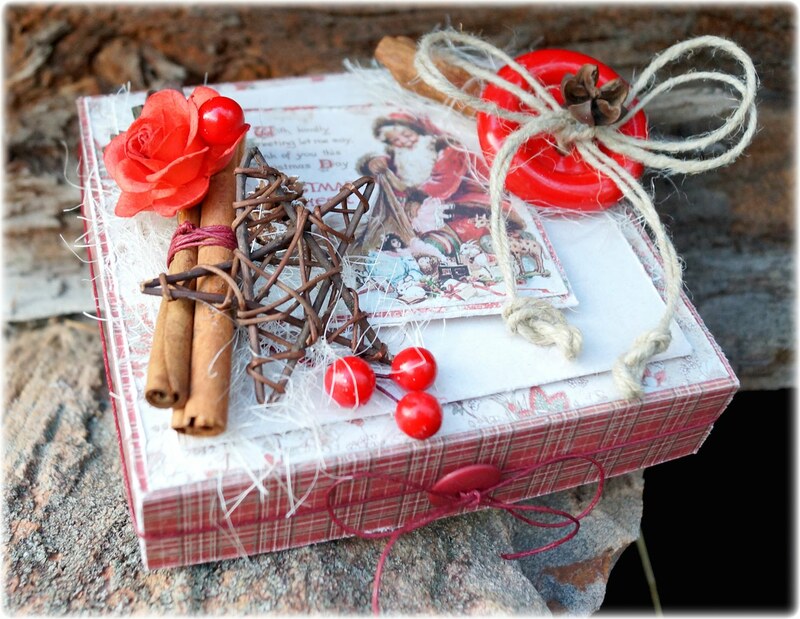 I’ve created a easy box using two papersheets from Home for the Holidays: Traditions and Together. This is the wooden box I have chosen to use. I have used double sided tape on all the edges on the lid and the bottom. When I make these boxes, I use not a cutting board. I remove the paper off the tape, I put down the page with the tape down on the sheet and use a Knife for cutting around. I do this to the box is covered. 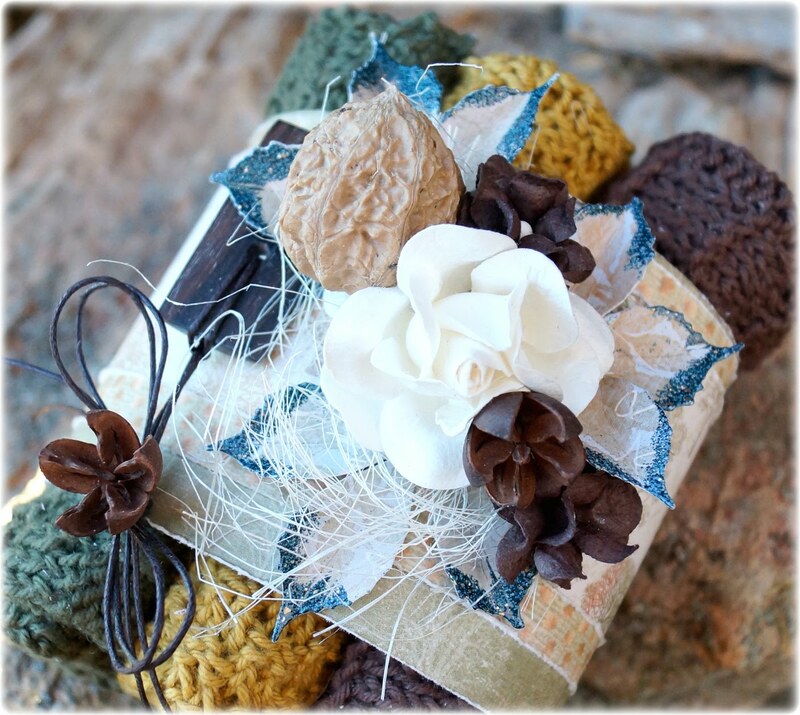 It’s an easy way to decorate boxes on, you do not have a measuring the paper and use your cutting board. The bottom part of the box, I turn, then I attach the feet in bronze under. In this way the box have something to stand on. Use a knife to go over all teh edges and scratch the paper. Then you get a vintage look without using ink. I’ve spent four shipboards from Wycinanka, I’ve embossed them with gold powder before I glue them on the sides of the box. 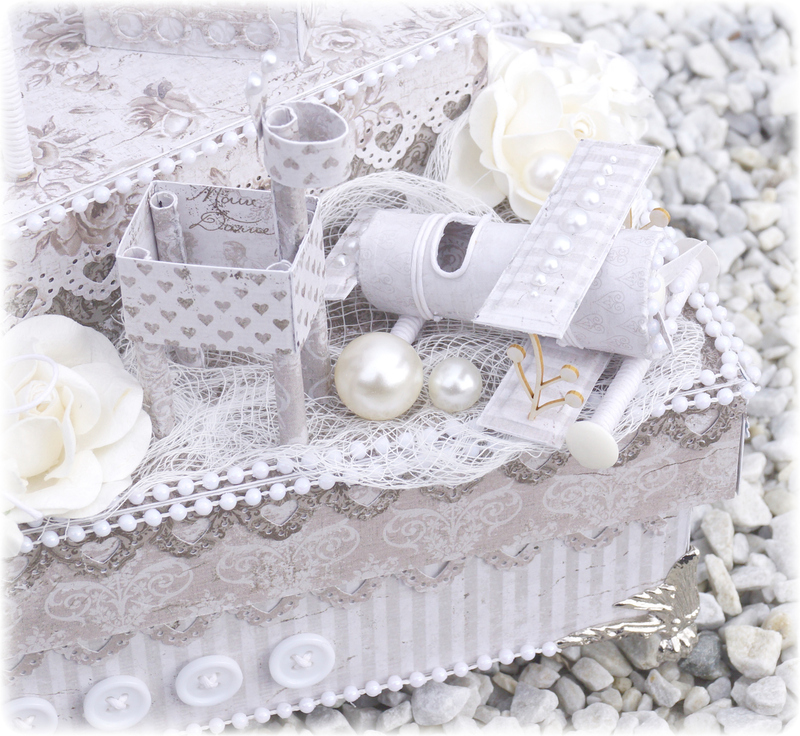 On the lid I have attached some white cotton ribbon. 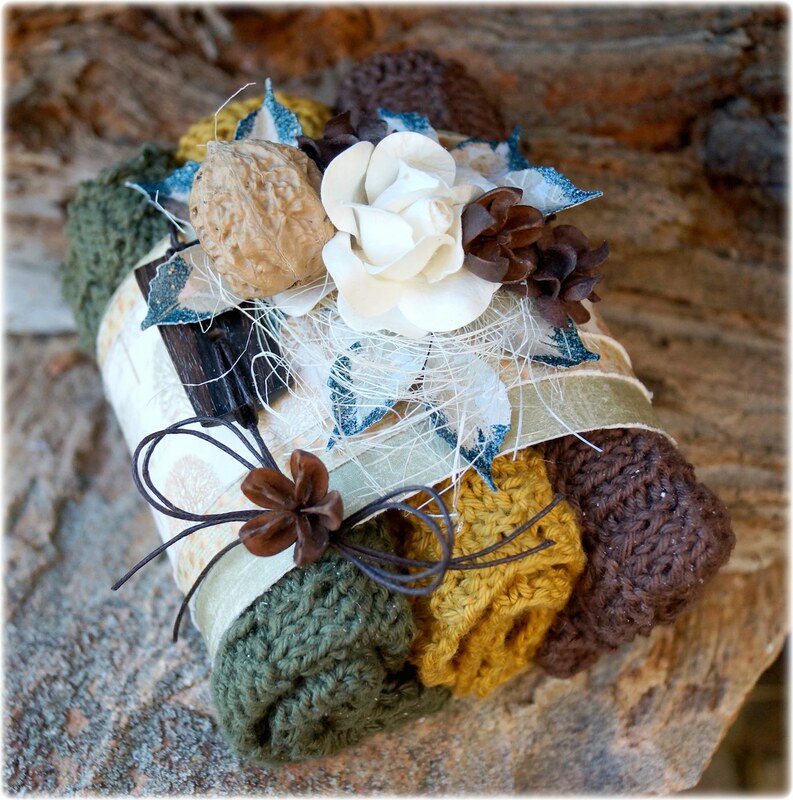 On the top of the lid I have used flowers, walnuts, mushrooms, cinnamon stick, stars and one button. 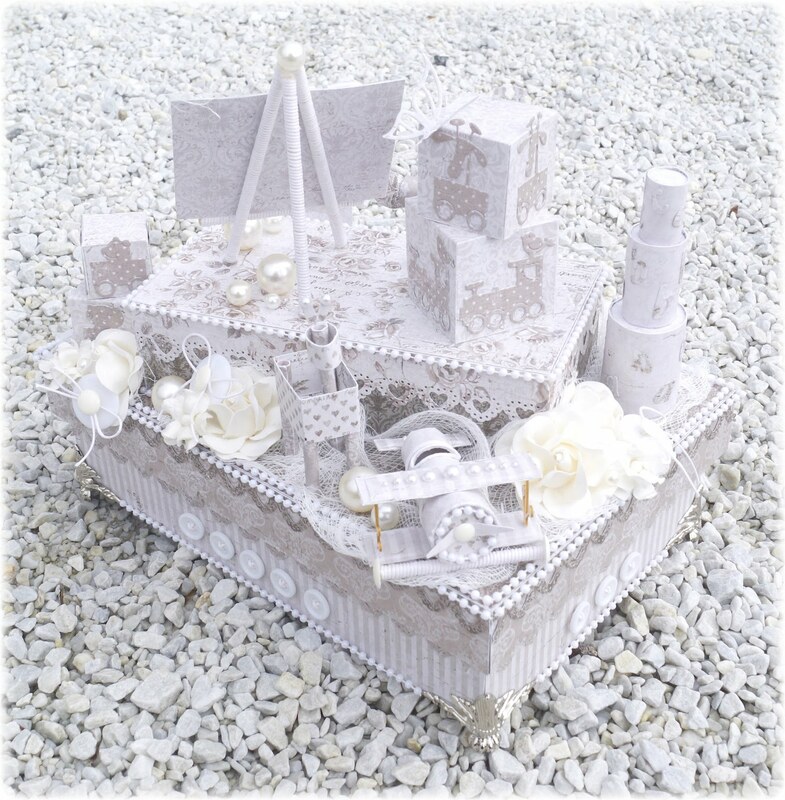 These I have covered with True Snow, Plastik Snow and Glitter. It’s really difficult to take images along the way while placing flowers and details, because I constantly had to move them around along the way. But I’ve done is I’ve just built around three large white flowers until I was happy with the lid. 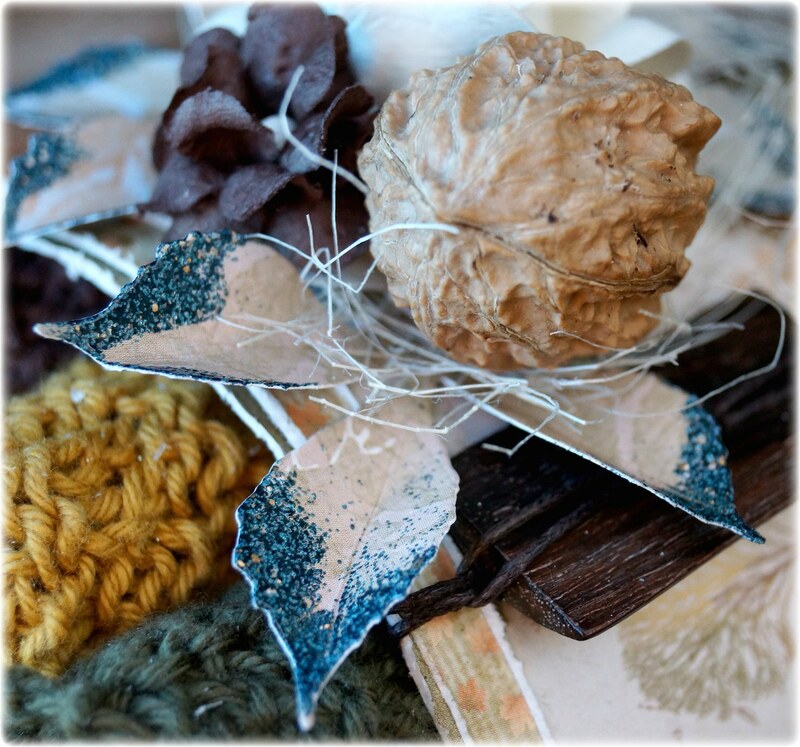 Today it’s Thursday and I am ready with a new project for Maja Design. I must admit that I’m not quite finished with the summer, even if it rains all day long, the forest begins to change colors and the temperature drops, you se I want to keep the summer a little longer, least in my projects. Today I have 3 Lollipop cards I want to show you, considering that this is the first time I’ve made ​​lollipop cards, I like them alot. 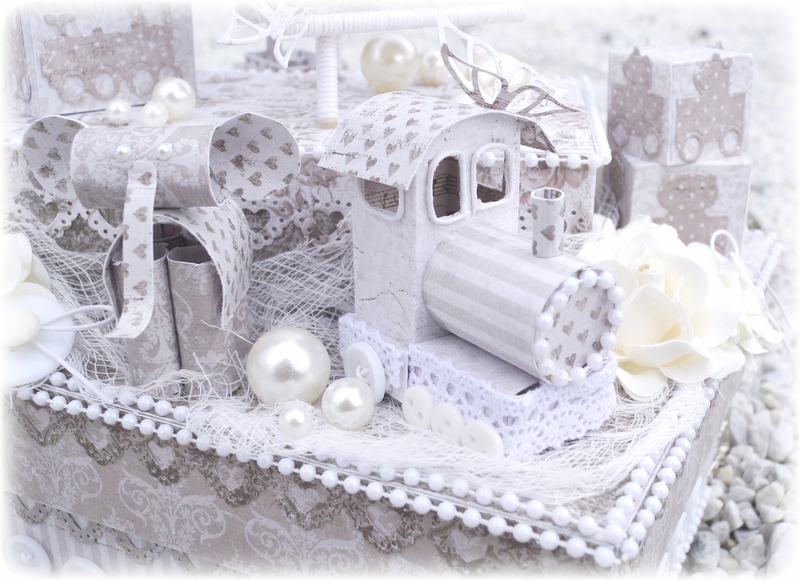 All the cards are made in ​​the same way, with the same details, but what separates them is the colors of the pattern papers, the embossing powder and the dieses I’ve used. I have used the pattern sheets from the latest collection called Summertime. To the card in blue, I’ve used these paper sheets: It’s My Favourite, Gives Me Joy, Cute Summer Dress, Glittering Water, Watch the Boats and Having Fun. The edge of the cards is made with a punch from Martha Stewart, on top of the first layer I have several layers of patterned paper in different sizes and also spent some cheese cloth. 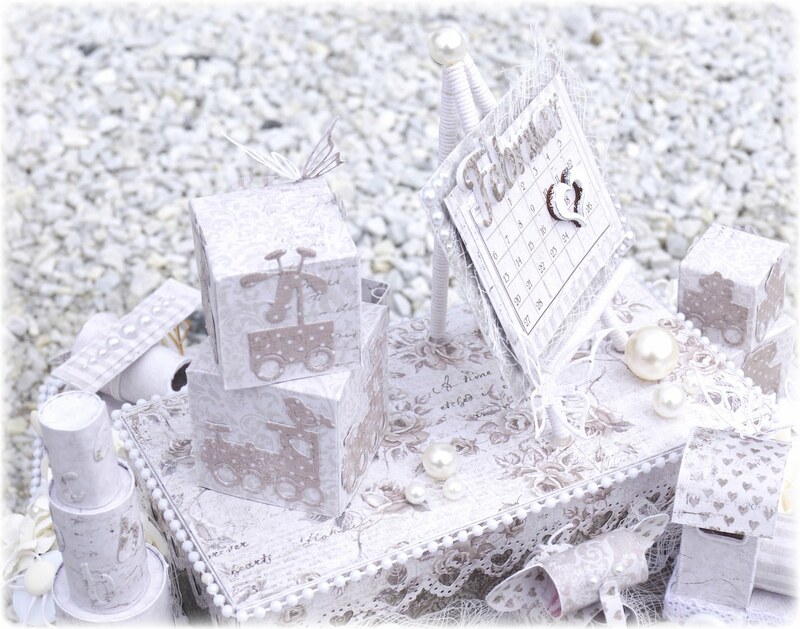 Under the white flowers, I have some leaves that I have embossed with Shabby Blue, a powder from Stampendous. The butterflies are a die from BoBunny, here the wings are embossed with the same powder as the leaves. Also under the flowers I have some wood from Wycinanka which is embossed with white powder from Ranger. In between all the flowers I have a light blue button with a bow and on top of it, I have a small navy button. Over the card I have one die from Heidi Swapp with the word Imagine. When you turn the card, you can se that the card have a simple backside. If you Open the bow you can writing a greeting inside the smallest circle. The second card is the card in green. I have used these sheets from the Summertime collection: Greenery, Taste the Strawberries and Is Always the Best. This card has as many layers as the card in blue. Word Lovely is also one dies from Heidi Swapp and the buttons have been replaced by someone in green tones. Here are the leaves under the flowers embossing with Aged Hunter, one powder from Stampendous. The butterflies are embossed with the same green powder and comes from one set of three butterflies from BoBunny. If you flip the card, you se a new bow that you can open for writing a greeting. The last card is in red and since the colour was red, then I just need to use the word Bliss, this is also one dies from Heidi Swapp. The sheets I have used are called: Is Always the Best, Smell the Roses, Flowers Everywhere, Let’s go for a Ride and Ligth Scarlet. The leaves and the butterflies is embossed with a powder of Distress Ink I do not remember the name of. The buttons on this card is in red and a big one in pink. The back is exactly the same as on the other cards.